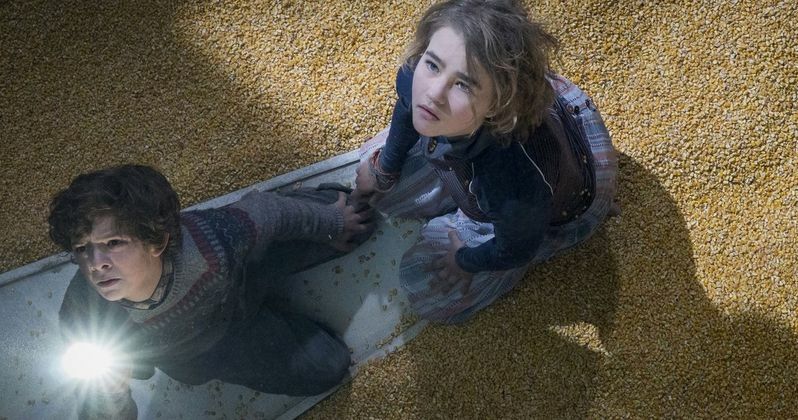 A Quiet Place 2 will more than likely bring back young stars Millicent Simmonds and Noah Jupe. It has been reported that Simmonds and Jupe are in talks with the studio to return after it was revealed that John Krasinski is officially on board to direct the sequel and that Emily Blunt is also in talks to return. There were not a lot of people that thought the first movie, which cost $17 million to make, would go on to make over $340 million at the box office, so a sequel wasn't always the plan. There were not a lot of people who expected John Krasinski to return to his director's chair for A Quiet Place 2 either. After the first installment came out and was such a big hit, the director pretty much said that it was a done deal. However, the studio wanted to make a sequel and they wanted his input, even if he wasn't going to come on in an official capacity. One thing led to another and before we knew it, Krasinski was writing the sequel and then directing. Millie Simmonds and Noah Jupe starred as the Abbott family children. Simmonds plays Regan in A Quiet Place, who is deaf and must where a cochlear implant. Simmonds is deaf in real-life and John Krasinski wanted her because he "didn't want a non-deaf actress pretending to be deaf." However that wasn't the only reason. The director wanted to learn about deaf culture on the set and wanted everything to be as realistic as possible, coming from Simmonds' experiences and point of view. Jupe plays Marcus Abbott, the oldest child of the family. Obviously, John Krasinski won't be returning in front of the camera in A Quiet Place 2, unless it is for flashback purposes. Though story details are being kept under wraps at the moment, it looks like the Abbott family will be using their new knowledge about the monsters' weaknesses as they move forward. Sound editors Erik Aadahl and Ethan Van der Ryn say that the sequel is going to keep the best elements from the first movie while pushing the characters forward and having them change, which makes a lot of sense. Even with the original cast returning for A Quiet Place 2, we still could be introduced to new characters that the Abbott family comes across in the terrifying world the John Krasinski brought to life. Whatever the case may be, horror fans are more than likely excited to hear that the sequel is being made and with the involvement of Krasinski, who is a major key to the original's feel and success. Now that the casting process is underway, we should get some very basic story details in the coming weeks. The Hollywood Reporter was the first to announce A Quiet Place 2 casting information.